High-speed USB 3.1 performance of up to 150MB/s1 (32GB-128GB) means you spend less time waiting to transfer your photos, videos, songs, and other files between devices. Free up space on your smartphone or tablet2, or transfer files between multiple USB Type-C devices. 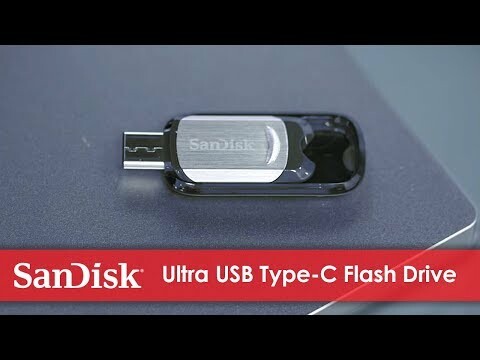 The super-thin SanDisk Ultra USB Type-C flash drive is designed specifically for next-generation devices with the new USB Type-C port. The reversible connector has a uniform design, so that it’s always right-side up, making it easy and fast to plug in. 1 32GB-128GB: Read speeds up to 150MB/s. 16GB: Read speeds up to 130MB/s. Write speeds lower and vary by capacity. USB Type-C port with USB 3.1, Gen. 1/USB 3.0 support required. Based on internal testing; performance may be lower depending upon host device. 1MB=1,000,000 bytes. 2 Mobile device requires USB Type-C port and On-The-Go (OTG) support. See www.sandisk.com/dualdrive-c for list of compatible devices. 3 Download and installation required.